Are you looking to rent a party bus? Do you reside in Bloomfield Hills? If so, then your search is now at an end because here at Rockstarz Limousine and Party Bus, we specialize in delivering an amazing time to our clients no matter the celebration or occasion. When searching for a party bus in Bloomfield Hills, you will have various options available, but it is always best to know in advance what you want. For most, there will be a need to have adequate space in the bus for all of your guests, and with us that will never be an issue. Instead, we have designed the bus in such a way so as to allow you to have the maximum number of guests celebrating the occasion with you. Our Bloomfield Hills party bus rental service allows you to take full advantage of our stunning stereo sound system that will turn this bus into a real moving nightclub. When you also factor in the laser light show, then you have a party bus that is full of atmosphere and unlike anything else that you have ever experienced before. 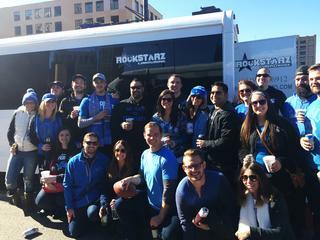 People have used our Bloomfield Hills party bus service to celebrate a number of different occasions. From the normal birthday party, to a special anniversary, or even a bachelor and bachelorette party, the actual occasion is entirely up to you. Our main aim is in providing you with an amazing experience where everything is under control allowing you to focus on enjoying yourself. So, anybody who is resident in the Bloomfield Hils area and who is looking to rent their own party bus should give us a call here at Rockstarz Limousine and Party Bus. Alternatively, you can contact us via our website and a member of our team will be in touch regarding your own individual requirements.